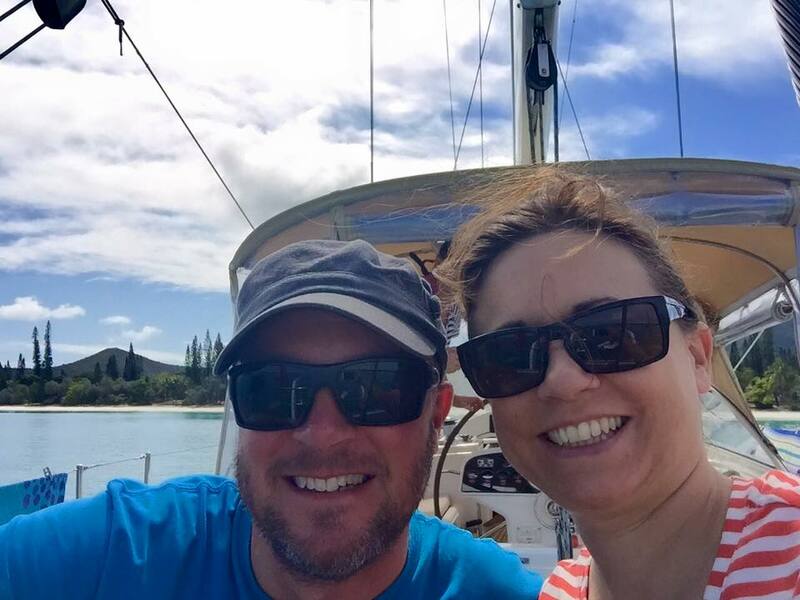 We are just back from cruising New Caledonia on a friends yacht. We had such a great time (post to come later on today hopefully) and we learn’t a few things along the way that might also come in handy for you if you plan to visit any time soon. New Caledonia is located in the Coral Sea on the Western Edge of the South Pacific Ocean, aprox 900 nautical miles North-West of Northern New Zealand, 700 nautical miles North-East of Brisbane or 250 ish nautical miles South-West of Vanuatu. The Island is about 200 nautical miles long, and is surrounded by a reef and lots of other islands, including the Loyalties and the Isle of Pines. You can pretty much sail around the entire island inside the main reef. If you aren’t sailing to New Caledonia, then chances are you might be flying! 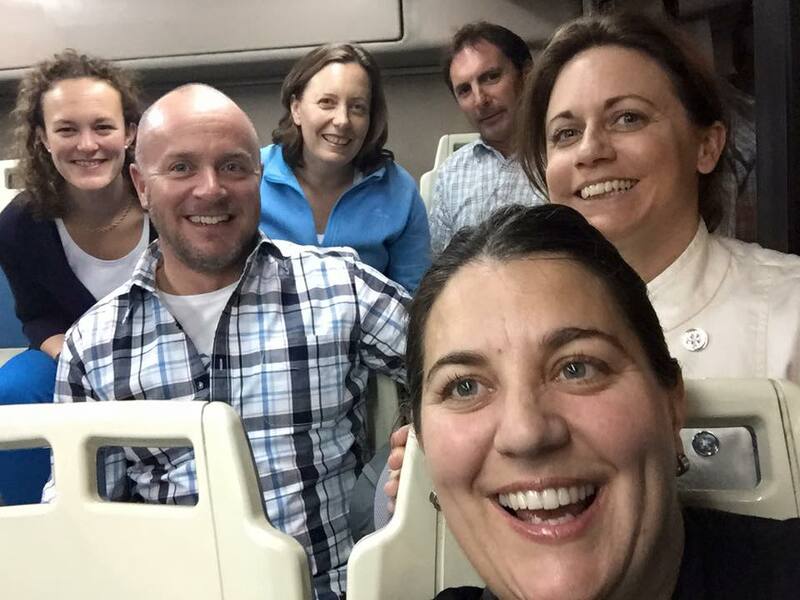 We travelled from New Zealand – its just a two and a half hour flight. We prefer to fly Air New Zealand to get airports, but this time we booked with Air Calin as their prices were much cheaper. When we got to the airport it turned out that we were on a codeshare flight on an Air NZ plane. So we got a much cheaper airfare and “The Works” a full meal and movies on board! So not only did we pay less, but we got more – apart from our airpoints that is. It is well worth doing a comparison. By boat – The main arrival port is Port Moselle Marina, which is located right in the centre of Noumea. There is a visitors wharf in the marina. More information about clearance formalities can be found on Noonsite. You can’t bring in any fresh fruit, vegetables or meat. 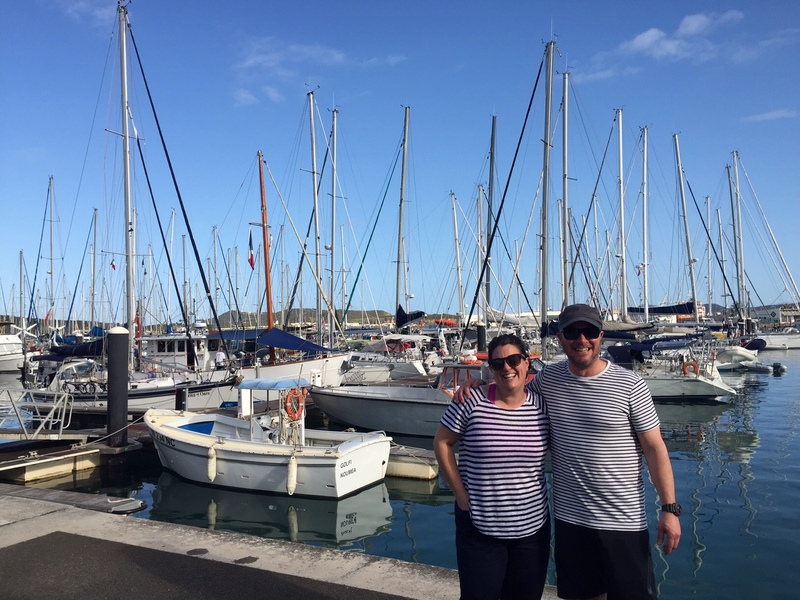 By plane – as the boat we were staying on was already in New Caledonia, we flew in to the International Airport which is about 50km north of Noumea. We pre booked a driver to come and pick us up which was CFP10,000 one way. This worked out better for the four of us as a transfer in the bus was CFP3000 each. It takes about an hour to drive on the highway in to Noumea. The airport is really modern. There were taxi’s available as well. Visitors with NZ or Australian passports can stay for up to 90 days without a visa. People with EU passports can stay for as long as they like so long as they are of independent means or self employed. If you want to work you have to get a visa. If you decide not to book a transfer, you can also rent a car. We booked online with Sixt Rental Cars and got a Dacia Duster – which is like a small 4WD, which had plenty of space for 4 adults and all our gear. Driving is on the right hand side of the road which was a bit challenging and stressful for Andrew, but he did get the hang of it. They have a depot at both La Tontouta – the International airport and also Magenta airport which is the domestic airport in Noumea. Our plan was to do a one way drop off – have the car for a couple of days. There was a small one way drop off fee, but as it turned out we got a friend to drop the car back to La Tontouta for us. The car worked out to be around NZD$250.00 for 48 hours, and we managed to cover some territory in that time. Not too bad considering the transfer one way in to town would have cost us around NZD$120.00. 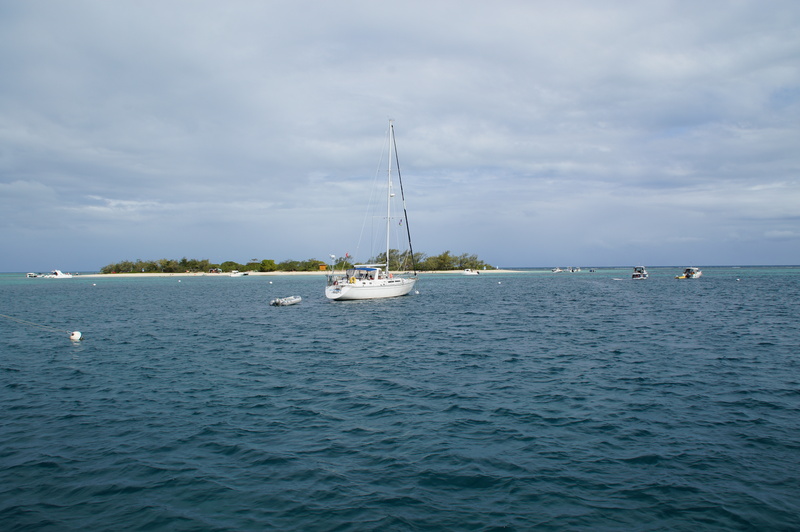 If you are joining a boat in either the Loyalty Islands or Isle of Pines, there are a couple of options. You can fly with Air Caledonie, who operate a number of flights during the day. They fly from Magenta Airport which is in Noumea – so about an hour’s drive from La Tontouta the international airport. Allow plenty of time if you are transiting straight through. They were super easy to deal with and promptly refunded our tickets when we had to cancel. Flights were around the NZD$100 ish mark depending on availability and ticket type. I was surprised that on the day we wanted to fly over to the Loyalty Islands all the flights were full so we had to book the ferry for that. The inter island ferry is called Betico. They run a fast ferry service out to the islands, but not every day. Check their website for the schedule. Their prices are cheaper than flying, and it takes a few hours to get out to the islands. They leave quite early in the morning and their depot is over in the northern corner of Noumea harbour (within walking distance of the Marina but quite a long walk if you had a heavy bag!) They arrive in Kuto Bay at the Isle of Pines and We Marina in Lifou – which is handy as they are also easily accessible by yacht. These people were not so easy to deal with, and as yet I have still not been refunded for cancelling our tickets despite the tickets saying they were refundable! Port Moselle is in a great location in the centre of town. There is also another marina in the bay next door, and large mooring fields in a good sheltered area just outside the marina. ‘A’ dock is the visitors wharf and it was packed with boats from all over the world. I think you can stay for up to a month here. There is a dinghy dock in the marina and if you are anchoring or mooring you can pay a daily rate to get access to the showers and other facilities. At the end of the visitors wharf is a very clean toilet and shower block. The showers are nice and hot, but you need to press the button every 10 seconds to keep it going. Bring your jandals (thongs or flip flops for those of you who don’t speak kiwi) to wear in the shower in case the floor is a bit icky. The marina office will give you a code to use to get in the door. This code changes every week. There is a fuel berth and they also sell beer and snacks and there is a lady there – Esther that will also do your laundry. Also at the end of the visitors wharf is a bar/restaurant. Great location, but terrible service! The waitresses were really rude. Such a shame as it is a primo spot. Update – we went back again this year and had much better service and the food was good. But the place is looking a bit tired. Beware of the tourist boats who zoom in and out at high speed and usually at the most inconvenient time during a tricky docking procedure! Radio up the marina to request a berth on VHF channel 67. The odd numbered marina berths are on the northern side of the pier. Wifi is available and has improved considerably since we were there last year. You need to get a code and password from the marina office which lasts for the duration of your stay. There is no pump out facilities in the marina and from the smell of it, some of the boats were not heading out of the marina to empty their tanks… eew. We just used the marina toilets when we were in the marina to avoid filling up the holding tank. All their contact details and lots more information can be found on their website – Sodemo Port Moselle. There is an excellent supermarket called “Casino” which is located a couple of blocks away from the marina. 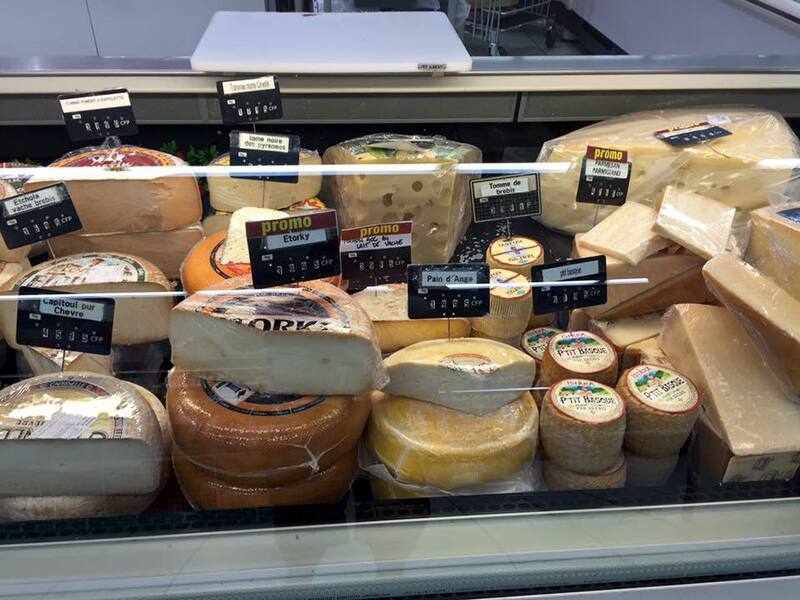 They have the most amazing selection of french food including an incredible display of cheeses, salami, and patisseries. Make sure you buy your alcohol in the morning at the weekends! All liquor sales stop from lunch time onwards, and apparently this has had a very positive effect on the level of drunken disorderliness, and car crashes with the locals. 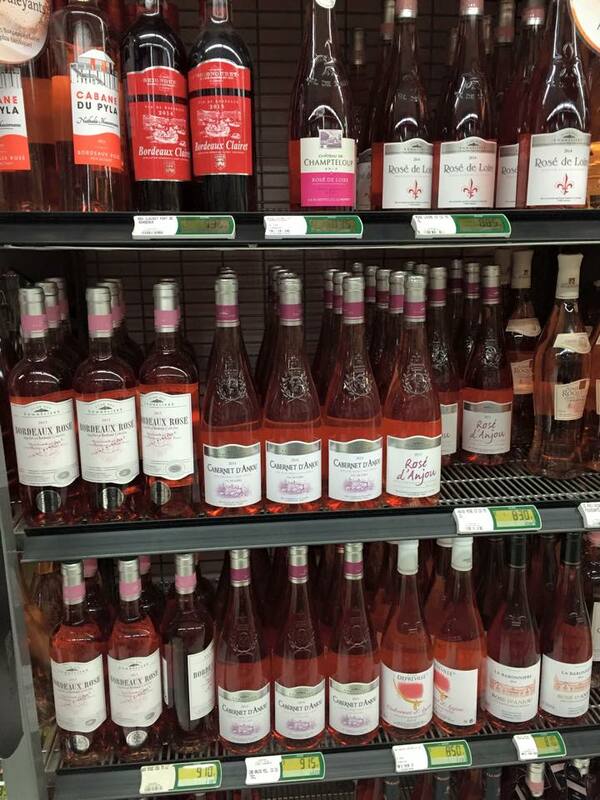 The supermarket has a great selection of French wines and the local beers “Number 1″ and ‘Manta” both got the big thumbs up from all on board. For fresh produce, you can’t miss the local market which is very conveniently right next door to the marina. There is fresh fish, fruit and vegetables. Take cash. It runs most days (perhaps not on a Monday?) from very early until lunch time. There is also an area selling T shirts, hats, sarongs and other markety stuff. Bring your own shopping bags as they don’t provide them in the supermarket, although you can purchase the more sturdy reusable bags which were really cool. They also don’t let you take your backpack in to the supermarket and you have to leave it in a locker. I was a bit uncomfortable about this as it had all our passports and phones in there. But it was still there when I got back thankfully! Tap water is fine to drink. There is the fuel berth in the marina and a petrol station just across the road from the marina as well. The currency is the French Pacific Franc. We used our ATM cards at the airport to withdraw cash when we arrived. There were plenty of ATM’s around the town, and at the supermarket it looked like they also took NZD, AUD and credit cards. However you do need local cash to shop at the market. The ATM dished out 10,000 or 5,000 notes, which work out to be about NZD$150.00 or NZD$75.00 each, so quite large denominations. There are coins as well CFP100 is about NZD$1.50. An easy way we worked out to do the conversion was to take off two zero’s and then add 50% – so CFP1,000 becomes 10. Then add 50% = NZD$15.00. Click here to get some other travel money tips. There is a good bus system, and a few different routes around Noumea town which we managed to navigate relatively easily. A ticket was CFP290 to take us from the marina to Baie de Citron. However the buses stop at about 1900 and after that we had great difficulty getting a taxi to take us back. After ordering one and waiting about 30 minutes one eventually turned up, but other than that we hardly saw any taxi’s. We saw lots of cruising boats with their folding bikes stashed on the deck, and there were bike lanes painted on the roads with speedy road cyclists and men dressed in lycra zooming along, so a bike might be your best bet. There are a few hills and they drive on the right hand side of the road. New Caledonia is a French Overseas Territory and everyone speaks French. We had a great time putting our very rusty school-girl French in to practice. Even though we tried our best to speak in French to people, they usually replied to us in English, but I think they appreciated our trying! 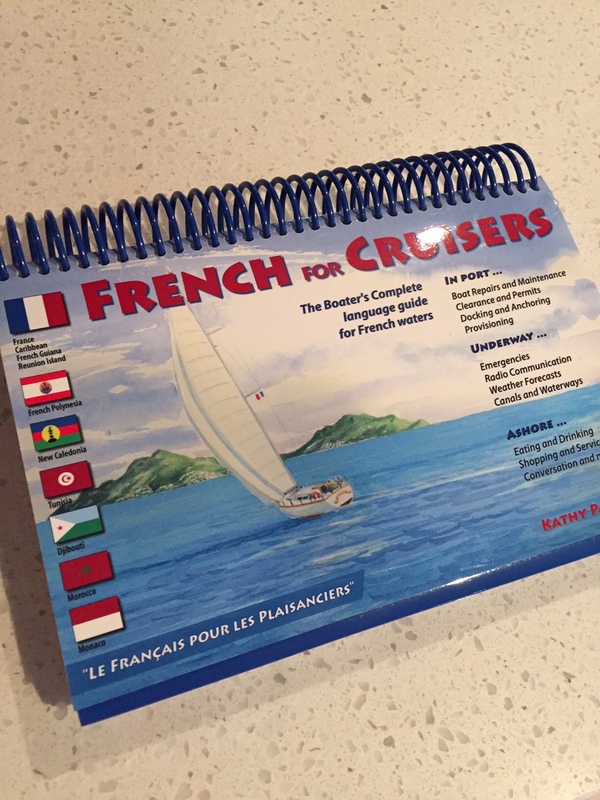 It is packed full of useful phrases, both for general daily life and then for more tricky cruising related words and details. We travelled in September, and it actually wasn’t as warm as I had been expecting. Bring a good waterproof jacket for when the squalls come through, and a jumper for the evenings when it gets cooler. The cruising season is over the Southern Hemisphere winter, and the Coral Sea Cyclone season runs from November to May, although the people we spoke to said that they happily stay there all year round. The prevailing winds are the South East tradewinds, which means it is a hard up-wind slog to get to the Isle of Pines – but it is well worth the effort! They tend to pick up during the day, so if you get up early you can avoid the worst of it. The weather is broadcast on VHF 16, everyday at 6:30, 9:30, 15:15, 18:30. But we used Predict Wind and Metvuw on our phones when we were in the marina wifi area. And also posted up on a noticeboard outside the marina office. There was excellent mobile phone signal everywhere we went. But sadly the Vodafone international roaming rates for both calls, texts and data were absolutely astronomical, so we pretty much all went offline until we got in to some free wifi action. 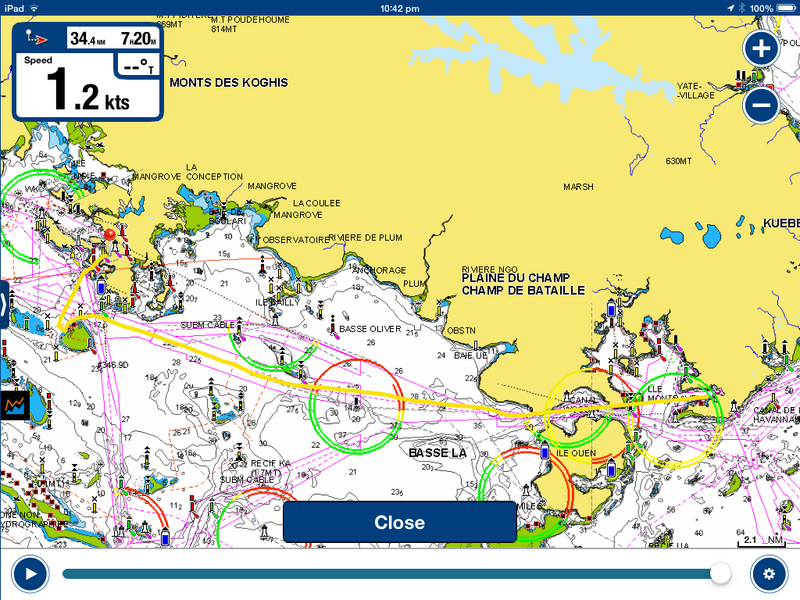 We used a combination of the paper charts, the Raymarine chart plotter on board the boat, and my Navionics app on my iPad. There are heaps of lighthouses, cardinal and lateral marks dotted about all over the place, and the charts were excellent. 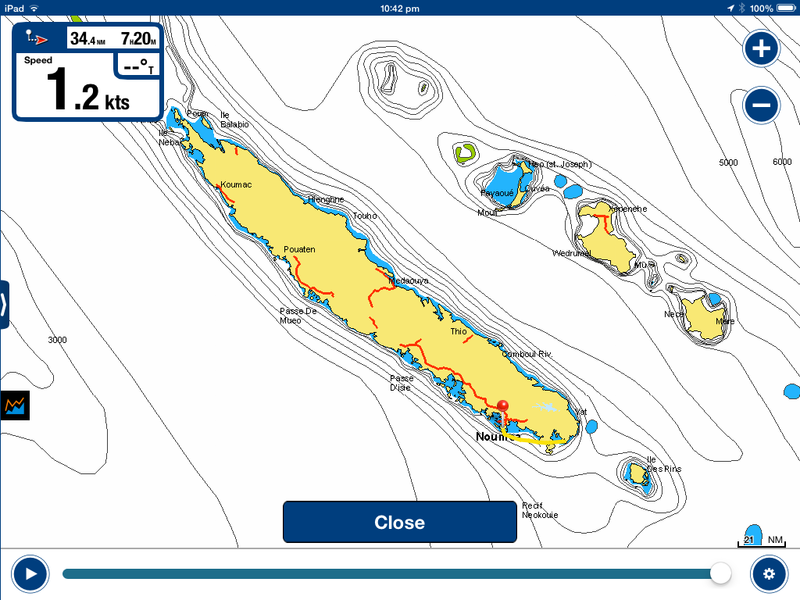 There are pink dotted lines with suggested preferred routes which were very handy as the charts all look very littered with things that you could possibly hit… There are reefs everywhere so extra care needs to be taken when navigating and also when anchoring. Not all the coral bommies are located on the charts in the anchorages. Some are awash at high tide and dry out at low tide. There are lots of wrecks marked on the charts – don’t become one of them! The boat we were on also had the brilliant New Caledonia Cruising Guide loaded on to their computer. The information was great. There were pictures of the places to visit, interactive charts, suggestions on anchoring or mooring and navigation etc. Expensive to purchase for a quick trip, but essential if you were spending any time there. There were a few prohibited areas which are clearly marked on the map and these are reserved for the military. 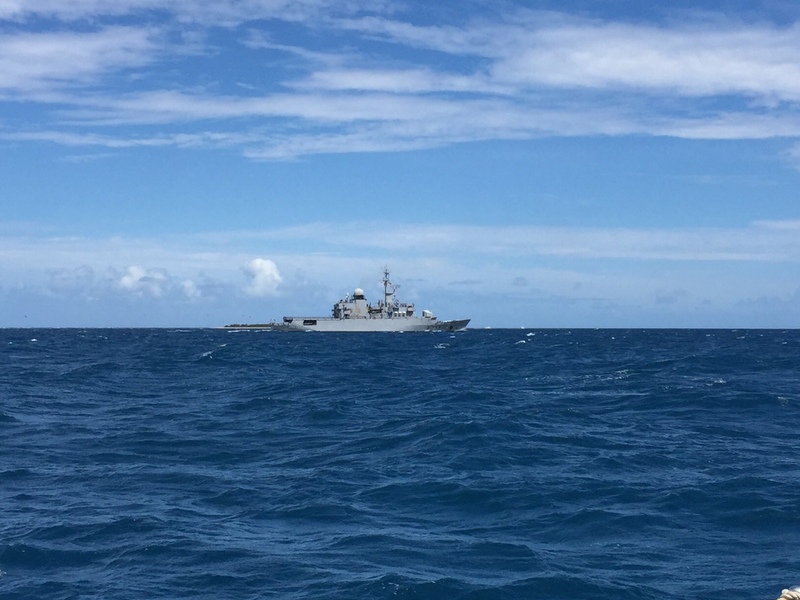 There were a few French Naval ships tearing menacingly around these area’s and so we didn’t have the nerve to find out what would happen if we dared sail in to their patch in case they tried to use us for target practice. Also keep an eye out for the many marine reserves. No take of any kind is permitted in these areas. 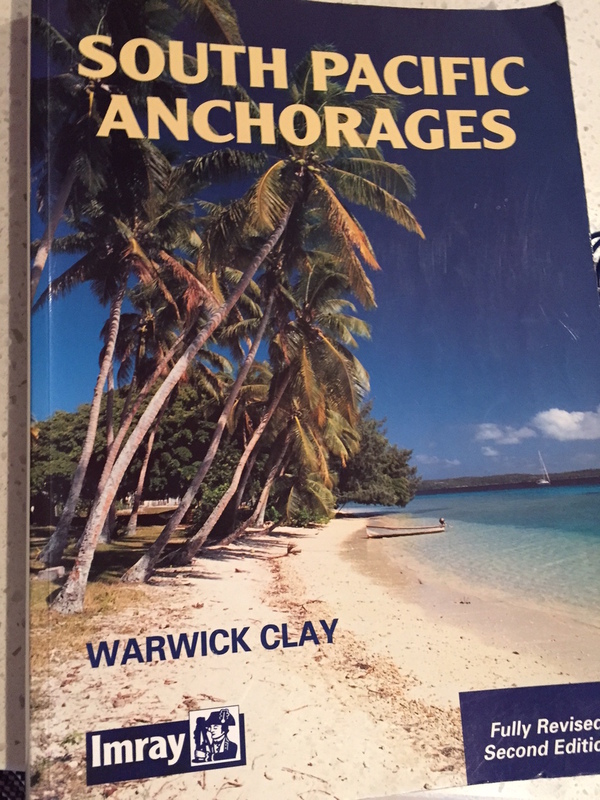 As well as the New Caledonia Cruising Guide on the computer I also bought the South Pacific Anchorages 2nd ed. guide which was also really handy for some anchorage ideas. The Navionics app also had many of the good anchorages marked and named, and I added in more notes and details to the places that we visited. There are numerous little islands and bays really close to Noumea itself. About 20 nautical miles South is the Baie du Prony which has got some lovely bays and anchorages and then we sailed the 40 miles down to Isle of Pines which is well worth a visit and has some of the most stunning beaches I have ever seen. We must come back and explore further afield and circumnavigate the whole island and get to the Loyalties as well. Many of the popular anchorages have public mooring buoys to use. These all appeared to be in good condition. They are a wire attached to a block at the bottom – no chain, which meant that it could pull quite sharply without the heavy chain to dampen the jarring. We got around this by using a stretchy rope to loop around the mooring buoy. I think the reason that these buoys are provided is to stop people anchoring on coral. This is of course bad for the coral and potentially bad for your anchor too if you get it stuck. Get some decent polarised sunglasses as these really make a huge difference in being able to see through the water to identify anything sharp looking underneath. The tides are semi-diurnal and have a range of up to two metres. There can apparently be some currents around the reef passes, but we didn’t go through these, so I can’t offer any personal advice here. Our Navionics app on the iPad gave us the tidal information we needed. I was pleasantly surprised that I didn’t get eaten by mosquitos for the whole holiday right up until the very last night when something took great pleasure in biting me all over in our hotel room. We did see a sea snake when we were snorkelling. We were told that they were poisonous but their teeth were located in the back of their mouth, so they can only actually bite you if you stick your finger in its mouth. Well I reckon if you go around sticking your fingers in to the mouth of snakes then you deserve to get bitten. Apparently there are a couple of islands where these snakes like to hang out too, but we didn’t see them. We saw a couple of huge cobwebs but thankfully not the owner of the web. I wore my Keen sandals when wading through the water to avoid coral cuts or stepping on anything sharp or poisonous. There were some very sharp looking kina (sea urchins) lurking under the water and after seeing many of my conference colleagues get whisked away to hospital within 5 minutes of arriving at our hotel in Rarotonga many years ago to get hundreds of little spines dug out of their feet – I wouldn’t recommend stepping on one. If you do happen to get bitten by something, then Noumea has got a very flash looking hospital and apparently there is also a hyperbaric chamber there too if you are a keen diver. Good to know, and luckily none of us needed to use their facilities. There was a fantastic chandlery that we stumbled upon on our way to the supermarket, down a side street near what looked like a Chinatown street. The selection of stuff they had in there was incredible, but the prices were super high… I can’t remember the name of it, but if you do, please comment below. This shop sold lots of clothing, bags, dive gear, galley gear etc. There is another chandlery just up the road from the Marina office at the bottom of the steep hill. This one sold lots of rope, wire, anchors and other fittings. 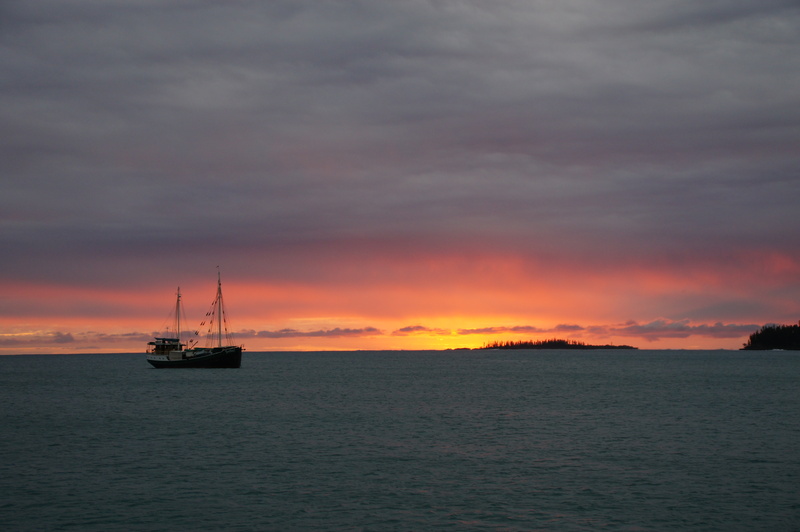 There are marine engineers, sail makers and haulout yards all available in New Caledonia. If you need some extra help with organising things Herve from Noumea Yacht Services is an absolute legend. He helped with all sorts of things for Esther Louise including filling gas bottles, booking transfers, arranging for sails to be repaired, and getting spare parts delivered to anywhere in the island. Herve is your go-to guy for anything nautical and he has an office near the marina in the little huts beside the charter boats. We didn’t get the opportunity to visit any of the local Kanak villages, but I believe that it is customary to ask permission from the chief first before you start wandering around and offer a gift. 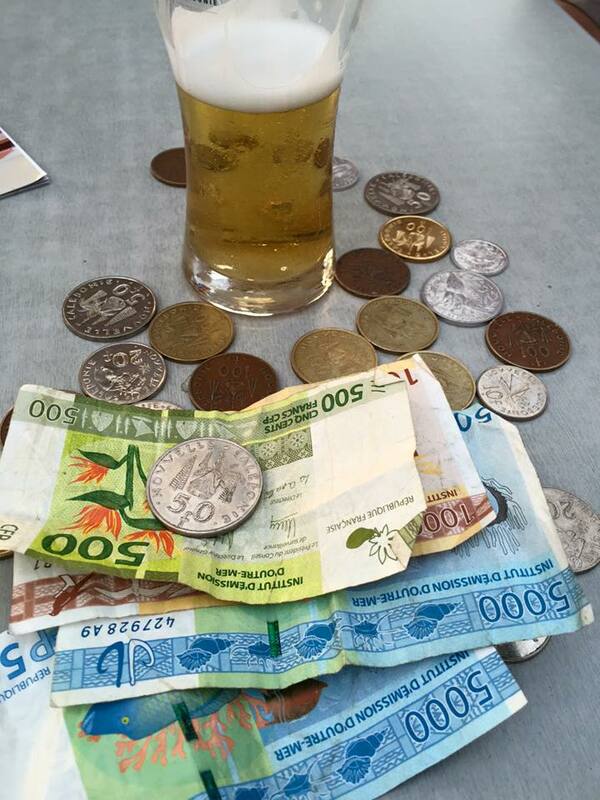 This can be anything from money – a suggestion was aprox CFP500 (aprox NZD$7.50) or a souvenir from your own country. The item itself isn’t as important as the gesture. So there you have it! If you have any other great tips, please do let me know. We were only there for a very short time, so I am sure the cruisers who have explored further afield will have some more gems of information to share. If you found this information super handy and would love to shout us a beer to say thanks, then cheers! You can click here to add some coins to our cruising/beer drinking kitty. Or just make a comment below, or share the info with anyone else who might be interested. Check out our adventures in New Caledonia by clicking here. Click here to save this article on the GPS My City App. Very well written, and helpful information. Chandlers, 3 in Nouville Pleasance (across the harbour from Noumea): Marine Corail, Speed Marine and Alto Marine, and one in town, South of the markets, Accastillage Republic. The latter has also a warehouse/retail outlet in Ducos. Thanks Hank and for the great tip too! I can’t wait to get back there and have another look around.